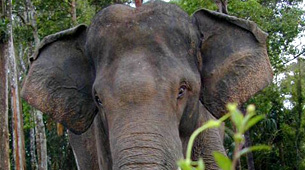 The Handapanagala area has been a highly publicized human-elephant conflict area in Sri Lanka. Elephants frequent this area causing depredation and hardship to the local people prompting the Department of Wildlife Conservation (DWLC) to drive the elephants into other areas. Two elephants will be radio collared to monitor their movements and determine their preferred habitat and seasonal ranges. This empirical data will then be utilized by the DWLC in the development of their elephant conservation and management strategies.